On July 25th 1857, Senior Constable Thomas Cooke single-handedly faced down a rioting mob of several hundred miners at the Golden Point diggings. The insurgents were on their way to destroy a camp of Chinese miners, who were at the time extremely unpopular on the gold-fields. Probably no-one would have then blamed Constable Cooke if he had backed down and allowed the mob to pass, but through his courage and determination to see the rule of Law enforced, he prevented what would otherwise have been a shameful massacre. Let his name be remembered in honour. Plaque commemorates Senior Constable Thomas Cooke. 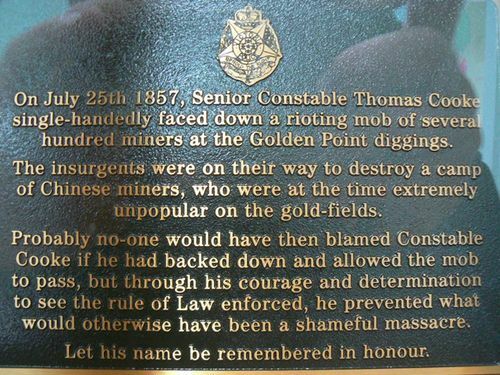 In 1857, Thomas Cooke, undoubtedly saved the lives of a number of Chinese miners from a public riot that could have had grave consequences for the young colony of Victoria. The foray commenced near the bottom of Golden Point, and out about a mile from the chief camp. The ringleaders of the affray tore down and destroyed mining equipment owned by the Chinese and the situation escalated. Senior Constable Cooke boldly placed himself in front of the mob and by his presence of mind, tact and discretion, lives were probably saved, and the Chinese camp not destroyed. A compromise was reached, giving the Chinese permission to remain for several more days. On leaving the police force Cooke took up the running of The Panama store at Chewton and suicided by hanging on the 28 August 1882.